A delicious, extremely popular hawker food in Singapore and Malaysia, the usual Prawn Noodle Soup is made with lots of salt and fat in all forms. One of my favourite childhood dishes although I always had to find the Chinese muslim stalls as I don’t eat lard. I’m told by my Chinese friends that the best ones are the ones made with plenty of lard – smelt like it too! This is one of my favourite noodle dishes, Healthy Prawn Noodle Soup, made simple by using either quick homemade prawn stock (right at the end of this page) or shop bought stock, full of vegetables, extremely low fat with a right balance of carbs and protein. 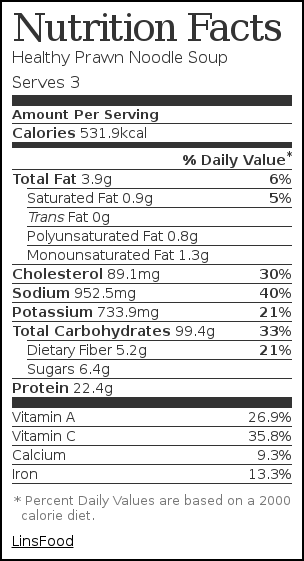 Traditionally, shellfish have had a bad reputation because like eggs and liver, they are fairly high in cholesterol and were deemed bad for you. However, in the last 10 years or so, as we’ve come to understand types and effects of cholesterol more, we’ve come to understand that dietary cholesterol, i.e. cholesterol found in foods, has much less effect on your blood cholesterol levels than saturated fats do. Prawns are also naturally low in fat, which to me means that in moderation, they make a perfect ingredient in any healthy, low fat dish, provided of course that you keep them as they are, not coated or covered in nasties! The perfect type of noodles for this dish is rice noodles or beehoon as you might find in Chinese grocers. You’ll find them fresh in all our major supermarkets here in the UK too but more often than not, they’re liberally coated with oil. For that reason, I prefer using dried noodles or those straight to the wok noodles (but please check fat content, if you are sticking with low fat). You can always give the fresh noodles a good rinse with warm water to wash off most of the oil. Udon noodles are fantastic for this too. If using dried noodles, follow instructions on packet for portion and how to cook them which usually involves giving them a soak. It’s so easy, we make the broth, add the noodles and serve! Give it a try next time you fancy a takeaway! I’ve given slight variations at the end too! 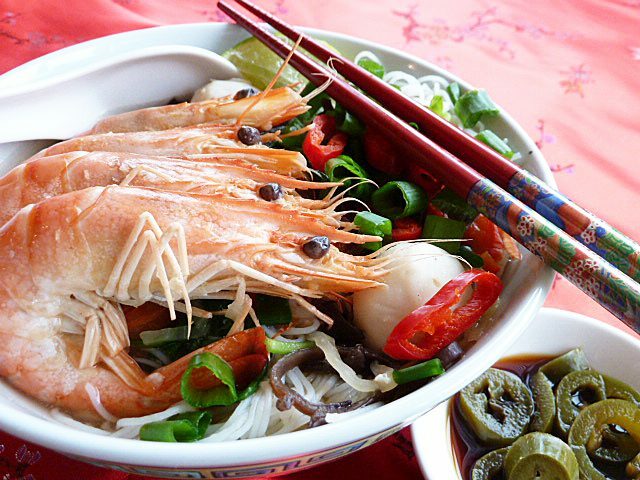 A delicious, extremely popular hawker food in Singapore and Malaysia, made healthier, with easy homemade stock from the prawn (shrimp shells). 300g (10.5oz) wet rice noodles, 400g if you're hungry! Place all the ingredients apart from the prawns and noodles into a large saucepan and bring to boil, then simmer on low heat for 3-4 minutes. Add the prawns and cook for 2-3 minutes until they're done. Add the noodles and cook for one minute (remember, al dente, you don't want mush). Check and adjust seasoning. Divide equally into 2 warmed large bowls and top with all the "to serve" ingredients. Replace the prawns with lean chicken breast meat, cut in bitesize pieces. Add a couple of bruised lemongrass (or half tsp paste), half tsp galangal paste and a couple of lime leaves to the broth and you've got a Thai style noodle dish. To the Thai influenced variation, add about 100ml coconut milk for yet another dish. Clean the prawns. Twist the head off carefully, leaving the rest of the shell on. The intestinal vein that runs along the back of the prawn should be visible and just sticking out. Give it a firm but gentle pull if you prefer to eat your prawns without. If you prefer your prawns completely without shell on, by all means, strip it naked, but keep the head and shell for the stock. When done, give all the heads a clean by squeezing the gunk out and rinsing them. Then place all the heads and shells if you’ve removed them into a saucepan, simmer for an hour, strain and use. You can add a little garlic, ginger, spring onions, Chinese rice wine or white pepper to flavour the stock. But I prefer to keep mine as is and add flavourings according to the recipe I'm using. Certainly in this case. Realmente exquisito me encanta tiene un aspecto perfecto y delicioso además de saludable,abrazos y abrazos. This soup looks perfect Lin! I love the colors of the ingredients! Haha, I had this a lot growing up as a child too. My more is Thai and spent a lot of her life in Singapore, and my father, although British, was born in kuala lumpur so I basically lived off dishes like this. Lovely to see a healthy version to help cure those January blues without the guilt. Awesome recipe. I had similar dish in Hong Kong restaurants many a times. The Thai variations are great suggestions too! Lin I don’t know what I do wrong but I have not received your post in email. I have done that before I did it today when I write my email address to subscribe it takes me to your about page? What does that mean? Is that all? Oh I love low fat dishes as much as I like the full fat one. It is all just a matter of balancing your diet. I am glad that you have used rice noodles. Yes, this is my kind of noodle soup and yours look perfect…I so wish for a bowl of this noodle soup to keep me warm. Have a great week Lin! This is my kind of food. I would love a big bowl of this soup, anytime. I am definitely going to try this. Will keep you posted. I love noodle soups and make them often…with probably more noodles than I should! We went to a Japanese place herein Denver last week and my hubby ordered a spicy salmon ramen bowl. It was so good, esp since it’s so cold and snowy here. I love Malaysian Food and this soup is bookmarked to be made very soon 🙂 I love these kinds of soups and it looks so easy and flavorful! Yeh! Yeh! Great minds sure think alike. Lovely meal and will be a good change from my version. As small size as I am, cholesterol is still an issue. However I am trying my best to keep it under control – plenty of oats in between. This is going on tonights dinner menu, I even have 95% of the ingrediants!